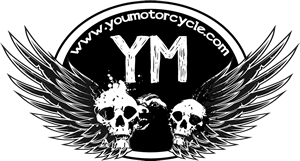 Motorcycle disk brakes vs. drum brakes? Which are better? Which stop faster? Which are more reliable? We’ll find out. While we respect the drum brake, and every rider’s right to his or her own opinions, we felt that in this 21st century it’s important to back up opinions with some facts. First off, we have to ask, if drum brakes are as good as disk brakes why don’t GP bikes or even sport bikes use them? They seem to be exclusive to low and small displacement cruisers and scooters. To answer that we need to understand how brakes work: Brakes use friction to stop the rotation of the wheel. That friction gives off heat. The better your brakes can handle (by this we mean disperse) the generated heat the greater your stopping power. Real life scenario: You’re on the highway and need to hammer the brakes from top speed. Once the shoe in your drum brake overheats it will feel weaker and spongier. This is called brake fade. Drum brakes generate heat in an enclosed space, disks brakes flow through air for cooling. Some disk brakes are even made of multiple components (“floating rotors”) to better disperse heat and avoid warpage. Disks get contact from two pads generally with multiple calliper pistons and will result in better stopping power, and good disk brakes are far less prone to brake fade than a drum. Finally, did we mention drum brakes are a royal pain to service? Every time you want to do maintenance (inspection, cleaning, or replacement) of your drum brake you’ll need to remove the rear tire off your motorcycle. Every time you adjust your chain you’ll need to make sure you properly adjust the drum brake to be realigned. Get too much dust from your shoes and your drum brake will begin squealing. The drum brake on my KYMCO Venox sometimes squeeks if the bike was left in the rain for long periods of time. None of these problems occur with disk brakes, so who needs the hassle for a poorer performer? Motorcycle disk brakes vs. drum brakes, what do I think? Personally, I sold my 2004 Suzuki Marauder VZ-800 in favor of a Harley-Davidson Sportster because the Sporty had a rear disk brake. It’s something you should think about from a safety and practical perspective. Please leave a comment below and check out our safety tips for scooterists and small motorcycles! My name is Ather I have Suzuki GD 110, it is 108 KGs and 110cc bike it has drum brakes in both front and rear wheels, a few days ago I use brake in a little emergency situation and my bike slipped on the road. Brake gripped the front wheel and slipped bike from front side. PLEASE SUGGEST, SHOULD I GO FOR DISK BRAKE? DOES DISK BRAKE IS EFFECTIVE IN THIS TYPE OF SITUATION? CAN DISK BRAKE SAVE BIKE FROM SLIPPING? This is an interesting question that few people are willing to answer. Are discs more resistant to skids? My belief is that they are, but that’s just my belief – I haven’t got any proof beyond my own experience. My old Honda’s front drum brake was downright dangerous in how easily it would lock up under hard braking; my Yamaha’s rear drum skidded easily where I’ve had a Triumph and a Harley with rear discs that stop straight and true, especially on the Harley. There’s no difference in stopping power between drums and discs on a given application, at least on the first stop cold. Either brake can lock the wheel, no problem. The problem is, your goal isn’t to lock the wheel! Locking the wheel is Bad. Precision control of your brakes is Good. For that reason, my opinion is that the main advantage of disc brakes for mild street riding has nothing to do with fade; it’s simply that the disc brake has better control. Drum brakes have a mechanical linkage; disc brakes have a very slick hydraulic system that responds instantly. Drum brakes are partially self-applying to keep your effort down, and when you release the brake you wait for a spring to push back the linkage and pull back a rather large set of shoes which do not respond as quickly as we might hope… it’s pretty good (like measured in milliseconds) but not instantaneous. With discs, you let up the pressure at the lever and the braking force falls NOW. When you’re dealing with a wheel on the verge of skidding, those milliseconds count. A skilled rider can keep a disc wheel right at the edge of what traction allows without actually locking it; a drum simply hasn’t got that level of control. And in the end, if you can afford anti-lock brakes those are hands-down the best system for the average rider on the street. An expert rider on a non-ABS bike MIGHT stop (slightly) quicker than an average rider on an ABS bike… but on wet pavement, the average joe on the ABS bike will probably still win. Technology is your friend. There is far too much work and probably custom fabrication involved to be worth changing all of the parts involved to make a drum brake motorcycle use disk brakes. The two are not compatible, sorry. We need more details to answer questions about slipping. Please email us if you’d like. Disk brakes are always prefered. Not always. A weak rear drum brake is good for slow manuvers for beginers who have a hard time controlling thier pedal. LOL: “Motorcycles don’t have pedals.” – classic comeback :) …My first bike was a Honda cb 250 (’81, model ‘T’, I believe)…although the family had many motorcycles throughout the year’s, I didn’t start riding until I was 26 (in 2000). the cb 250 was fun for what it was but it was old and not very well maintained, and I really didn’t have a clue. so one day when I had stopped at a pedestrian crossing…the back wheel locked up and I couldn’t movie. It took me a few seconds to figure it out (although it felt like minutes with all the cars tooting their horns behind me), it finally clicked, the bloody drum had seized! I got off the bike and started to heave it to the curb…slow going, but I got it there. After catching my breath I decided that getting to work on time was more important then a functional rear drum so I proceeded to rock the bike backwards and forwards as violently as I could and…snap! something gave way…not actually sure now from memory what that was(internal or external to the drum case), but regardless, I had a functioning vehicle again – that’s all that mattered :)…I swore that day I’d never get another bike with a drum brake…so far so good. Luckily you were at a stop and not on the highway! I can’t wait for them to phase these out completely. Hi, I want to buy honda cb trigger but i can’t take decision whether I should buy buy double disk break or single disk break option. Although double disk break option is 10k higher than that of single disk break option but would it be worthy of. Hi Tamin, if you’re doing a lot of frequent stopping from fast speeds, or if you are heavy set or ride with a passenger very often, you might benefit from the second disk. If not, and you don’t do hard braking very much, the single might be just fine. Shud I bye bullet gm grey classic 350 with a rear and front disc brakes plzzz suggest. Hey Yaseen, thanks for reaching out. I wish I could help, unfortunately that bike isn’t available in my market, so I’ve never seen it or tested it myself. Ride safe! Hi Laura. Yup. Disk brakes generate much more stopping power, so you don’t need to mash the levers as hard as you do with drum brakes to get the equivalent stopping effect. It sounds like the lever or some switching might have been knocked about a bit out of control in your case though. Might want to ask the company you’ve rented the bike from to take care of that for you. Thanks, I thought disk might be the better way to go. Just a few days ago, the drum on the rear totally seized up while I was on the road; I’ve decided I hate them and they seem to hate me, too. Geez, Laura. That’s scary stuff. What are you riding on, some kind of 1960s-1970s death trap?! Glad you’re ok. That could have gone really bad. Ha, you’d imagine so but it’s a YBR, only 2 years old!